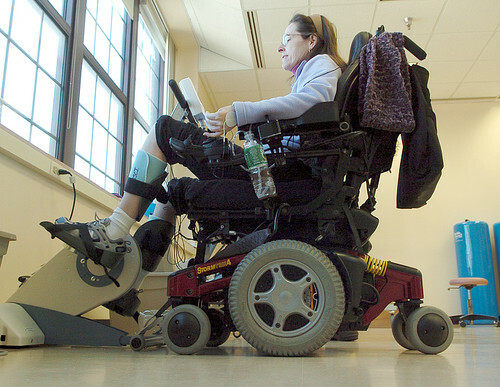 After Peggy Ingles was paralyzed in a riding accident, she was told she'd never walk again. Now she's back in the saddle. For Peggy Ingles, a trip downstairs to the stable was like walking to the kitchen in the morning to start coffee. She could do it in her sleep, and practically did on some days. That was before the fall. Before the riding accident that left Ingles, a champion rider from northern Baltimore County, paralyzed, with only the slightest ability to move her arms. Before the operation, the weeks in the nursing home, the months of treatment with, at times, no great hope for success. Now a physical therapist pushes Ingles in her wheelchair across the gravel parking lot of a Cecil County ranch and toward the barn. The head of the therapeutic riding program chats about a recent ride on a feisty chestnut Arabian, and Ingles returns a knowing smile. "Oh, a hothead," she says. "I don't mind a hot rod, as long as it has good brakes." A Norwegian pony is maneuvered toward a wooden ramp. From there, Peggy Ingles is lifted from her wheelchair. She had spent her entire adult life working on horse farms in the area - training horses, breeding them, selling them and boarding them. At the U.S. National Arabian and Half-Arabian Championship, Ingles won the top honor in the half-Arabian "working hunter class" in 2002 and 2003. In 2004, she was leasing a 30-acre spread in Monkton - Starstruck Farms, she called it - where she boarded and trained horses. Her son, James, was living off campus at the University of Maryland, College Park , and she was home-schooling her teenage daughter, Cassie. On Sept. 1 of that year, Ingles was exercising a 5-year-old retired racehorse, trying to retrain it so it could be ridden recreationally. Female horses were running in the adjacent field. Within seconds, Ingles' horse pivoted onto a slight incline, raised its head and fell backward. Ingles' neck hit a fence. She was flown to Maryland Shock Trauma Center. Tests showed her spinal cord was deeply bruised but not severed. Ingles spent time in rehabilitation at Kernan Hospital in Baltimore and at Manor Care in Towson. Friends came by daily for months, taking turns helping Cassie with the barn chores. Fundraisers at local horse shows and at a Monkton restaurant helped cover the cost of some medical bills for Ingles, who has no insurance. She was able to move back to her farm last year, continuing physical and occupational therapy as an outpatient. When she regained the ability to move her left arm, she named it Kate after her occupational therapist. But her physical therapist at the time told her to be prepared to spend the rest of her life in a wheelchair. Ingles started to believe she would never walk again - much less ride a horse. She closed her farm in August. Four of her personal horses were leased to new owners, including one horse that is helping an autistic child in Pennsylvania. "It was devastating," Ingles says of the closing. "But I had to do it." Cassie went to live with her father and start college. Ingles moved to a small apartment in Towson. Hired caregivers come each morning and night to prepare meals and help her bathe. In March 2005, at a fundraiser for the nonprofit that Ingles helped to found, Maryland Network for Injured Equestrians, Ingles met an executive at the Kennedy Krieger Institute. He wanted her to start therapy at their new center for spinal cord injury, headed by Dr. John W. McDonald, the neurologist who had treated actor Christopher Reeve. "They said I was perfect for the program," says Ingles. "But I was skeptical." Then, she met Patrick Rummerfield, a former quadriplegic who regained his ability to walk 3 1/2 years after the car accident that left him paralyzed. Seventeen years after the accident, Rummerfield became a marathon runner, using similar techniques to those now used at Kennedy Krieger, where he recruits patients. He calls Ingles "a bright light." Ingles scoffs at the idea of being an inspiration. "You can go, 'Woe is me' and give up," Ingles says. "I'm just in denial. I can't imagine being like this for the rest of my life." "Finally someone handed me the hope I needed," she says. "Christopher Reeve died thinking he would walk again. You need that." Ingles started treatment three times a week at Kennedy Krieger in July and working on therapies at home, making gains that have astonished the staff. "She's on a remarkable recovery curve," says McDonald. The clinic treats about 50 patients, though 150 more are working on the in-home portion of the therapy. About 65 percent of the spinal cord patients are children and teenagers. With a waiting list and only 20 physical therapists, the clinic needs to double its staff. The approach is twofold: By using electrical impulses to stimulate muscles to move, the body repairs the broken pathways from brain to limb, McDonald says. And, he says, by exercising, patients are in better condition to benefit from treatments that are being developed. "These disorders aren't as impossible as they once seemed," says McDonald, but adds: "We're not offering miracles. It's not days or weeks. It's months and years, sometimes." 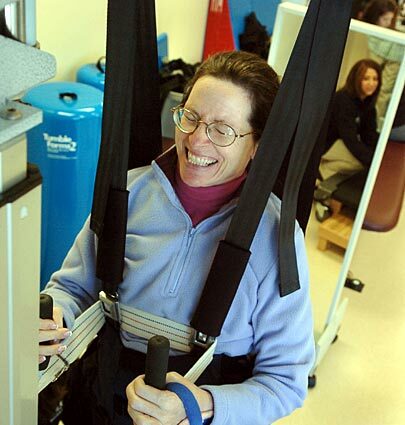 After working with therapists at the center, patients continue to stimulate their muscles at home. And even after a patient has learned to walk again, McDonald says one day, they have to continue therapy because the aging process is more advanced in people who have had a spinal injury. Ingles, beginning one of her three-hour therapy sessions, overhears him. "Hey, you didn't tell me that," she says, laughing. "Great, I'm going to go from walking to a walker." Two of Ingles' favorite therapists, Jessica Oginz and T. Ann McElroy, pull straps up over Ingles' hips so she can work out on a treadmill. A harness lifts her toward the ceiling. It's not unusual for Ingles to start singing Mary Poppins tunes as she's hoisted into the air. "Sometimes, we're laughing so hard, we're crying," says Elise Babbitt, a spokeswoman for Kennedy Krieger. When the harness lowers Ingles, McElroy and Oginz each take one of her legs, guiding their movement into a stride. Ingles tightens her jaw, looking as if she is trudging through snow. She smiles through clinched teeth and says, "It feels so good." "Come on, Peggy," McElroy coaches. "Ten more good ones." "Nice," Oginz says, praising Ingles' efforts. At 47, Ingles is learning to walk again. She remembers laying on the field after the fall and thinking that she might have ridden for the last time. But she's at a point in her therapy where she might benefit from the balance and muscle control demanded by riding horseback. "I know I'm not going to jump a 3-foot course," she says. "But there's something about it that's magical. Just being around the horses is such good therapy." As the date neared, she wasn't sure what to expect. "I hope I'm not this blob. I want it to be fun," she says. "I just want to get some horse hair on me." On Thursday, at the Freedom Hills Therapeutic Riding Program at Rolling Hills Ranch, near Port Deposit, she got her chance. Within seconds of being maneuvered into the saddle, Ingles' feet, out of instinct, fish for the stirrups. A cool breeze whips through the barn's open doors, smelling of fresh grass and worn leather. McElroy loosens her grip, and Ingles, using her own muscles, sits tall on the horse's back. Her smile is pure joy and triumph - the expression of a child riding a bike for the first time without training wheels. Renee Sherrard-Luther and her husband, Carl Luther, stand by the horse, and their 15-year-old daughter, Ellie, leads the pony toward the arena. The pace is slow, and they stop every few seconds to adjust their hold on Ingles, who finds herself falling forward more than she'd like. Ingles regains her position and they move again. "Whoa," Ingles says, slipping again. "It's a lot of work." Then, she strains to sit upright. "The strength of a thousand riders is with you," McElroy tells Ingles. "Do you want to do another lap?" By the time they've circled a few times, Ingles proclaims: "I'm pooped." Back in her wheelchair, Ingles takes a brush to stroke the pony, Nina. "You were a good girl," Ingles says and then thanks McElroy and her hosts. Soon, the brushing motion becomes too difficult and Ingles apologizes that she can't do more. "Everything's therapy now," Ingles sighs. "Everything you take for granted." But she tells Sherrard-Luther she'd like to come back. Noticing the tiny hairs covering her fleece jacket, Ingles says: "It felt like home."